Arsenal are confident to finalise the signing of Denis Suarez from Barcelona before Thursday's transfer deadline. If the deal is finalized, which it is believed to be in the coming hours, he will be able to feature against title holders Manchester City on the 3rd of February. The Spanish 25-year old will act as cover and will compete with Mkhitaryan and Iwobi for a spot in the Gunners starting XI. 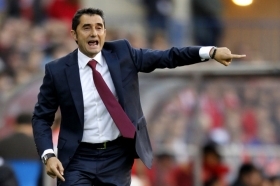 In the Barcelona manager's pre-match conference ahead of the clash against Sevilla, Ernesto Valverde reported: "Denis Suarez is on the verge of joining Arsenal". "There is not much left to make it official, we hope he does well, he has always acted with dedication and we are happy with him". Denis Suarez has been left out of the squad to face Pablo Machin's men, as the two sides will face off tomorrow, at 20:30 GMT. Arsenal will be looking to sign Suarez on a 6-month loan deal with an option to buy in the summer. The soon-to-be Arsenal player has a bright future and is believed to be able to adapt to the Premier League quickly.